Food served Mon–Thu noon–2.30pm, 5–9pm; Fri/Sat noon–9pm. Closed Sun. Pre-theatre times Mon–Fri until 6pm; Sat until 5.30pm. Elegant restaurant with smart service and clever cooking, focused on excellent local and seasonal produce. Despite its prime city centre location in the corner of Royal Exchange Square, you could be forgiven for not even realising that the Western Club Restaurant is there, commanding impressive first-floor views towards the Gallery of Modern Art beneath a canopy of twinkling fairy lights. It takes a ring of the doorbell to gain access to the private members club. You’re liable to be greeted by well-kent Glasgow restaurateur Jim Kerr, who has the place running with tight-as-a-nut trademark class and precision. Dishes such as seared scallops served on Stornoway black pudding with apple, watercress and radish salad or parfait of chicken livers and foie gras with toasted brioche and red onion jam are meticulously presented on sparkling white plates and zing with flavours and freshness. Succulent breast of free-range chicken, potato and turnip dauphinoise and wild mushroom are all tied together with a generous slathering of rich truffle sauce. With all kinds of temptations among a wide dessert selection – seven altogether, from a moreish malted chocolate parfait with crunchy honeycomb pieces to wintry lime, coconut and raspberry tart – you might need to order two. The Western Club Restaurant offers stunning views over the spectacular Royal Exchange Square. 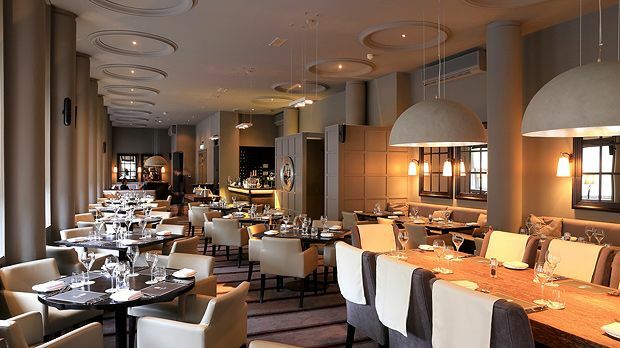 Smart, chic and centrally located, the restaurant is a must for all foodies. The well turned out staff deliver the kitchen’s creations in a stylish setting which combines a relaxed, elegant ambience with professional service.